What is a HAPPY CAMPER PHOTOBOOTH you say? a pose & let the fun be had. Put us on your guest list at your next event and let the good times roll, literally! Do you print on the spot? of the fun times they had! 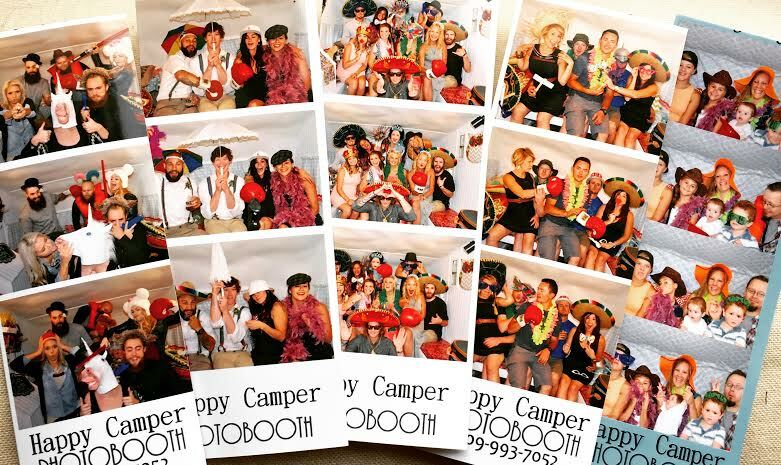 I am a venue owner and I had the privilege to work with Happy Camper photobooth this summer. I can not say enough about how amazing this company is. Libby, the owner, is professional, fun and so easy to work with. She cares about the experience of each guest and goes out of her way to make sure it's memorable. The other thing I love, is she took the concept of "photo booth" and created something unique, original and interactive. If you are looking for a unique way to leave your guests remembering how special your event was, this photobooth is a must. I recommend Happy Camper Photobooth to all my brides and I can't wait to work with them again during the summer of 2016. Happy Camper Photobooth was a highlight at my daughters wedding this past weekend. Libby and her son were great! High energy and super fun. I would HIGHLY recommend them for any event you might be hosting. We will definitely use them again. My husband and I had Happy Camper Photobooth at our wedding last summer and it was such a fun thing for guests! It went with our rustic theme perfectly and everybody raved about how much fun it was!! Libby was SO great to work with and flexible with our wedding schedule and provided exactly what we needed for our vision. We had a line out the photo booth when we were approaching our final minutes, so we just paid for an extra hour right then and there and she kept right on going! It was super fun and all of our guests have some great memories to cherish from our special day! Thank you again Libby!! Super cute for weddings a family reunions...but my ASB students wanted something memorable for their 8th-grade celebration in June, so we rented Happy Camper. Students got photos to remember their last day of school and I got the disk. I'd recommend Happy Camper Photo Booth to anyone!